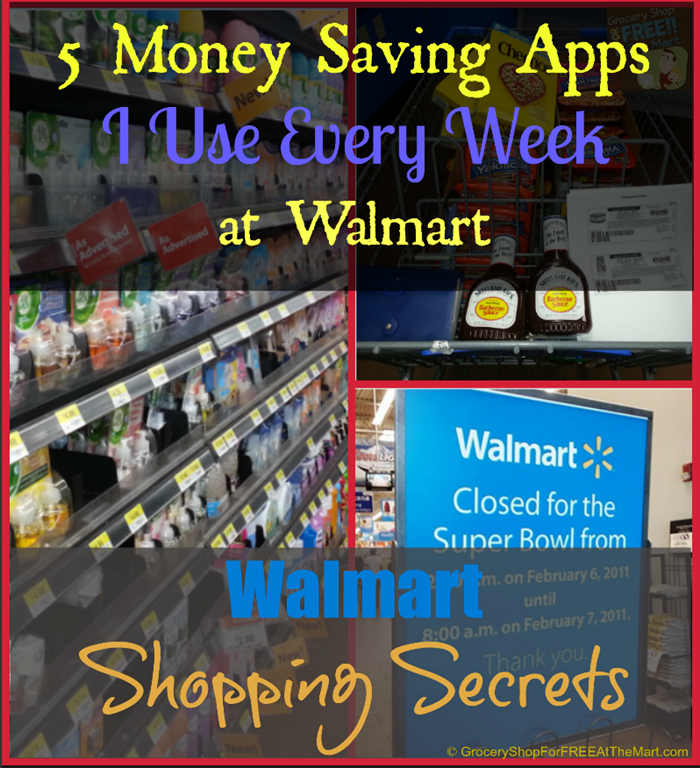 Walmart Shopping Secrets: 5 Money Saving Apps I Use Every Week at Walmart! When I first started couponing, smart phones didn’t exist. You just clipped your coupons and headed to the store but technology has really changed the landscape. 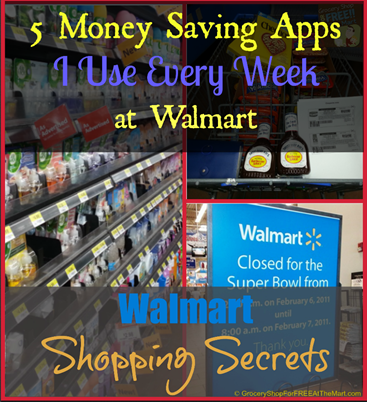 Here are 5 “Must Have” apps that make my life easier and save me money. Just click the link to get yours. Ibotta – This was the first “Take a Picture of Your Receipt” app I ever saw. Ibotta has rebates available for different items. If you bought a qualifying item, you will be asked to do something to “earn” the rebate. It’s usually something like watching a short video commercial or answering a short survey. In return you will get a rebate refunded to you through PayPal, Venmo or on a giftcard when you hit $20. You can see a list of possible Ibotta matchups here. Shopmium – Shopmium is a new player in the “Take a Picture of Your Receipt” game. The most important thing to know about them is that in order to unlock all the deals, you need a referral code. Mine is GMKACYRC, use it to unlock a FREE Lindt Candy Bar this week. The other cool thing about it is once you connect it to your PayPal account you don’t have to wait to accumulate a certain amount to get paid. Once a rebate is verified, you get it immediately. Receipt Hog – This one is unique in that there are no set rebates for specific products. You take a pic of every receipt you get, in return you get to spin a roulette wheel for chances to win money and prizes. You don’t win very much but anything is better than nothing. Favado – This is probably the app I use the least because of how I shop but I can certainly see how it would be useful. It has all the ads of all your local store matched up to coupons. My wife is a data contributor for this app so I know a lot of time and care go into it. Flipp – Flipp is one of the cooler apps I use. Every weekly ad in your area is scanned and searchable. Makes price matching a snap. Bonus: SavingStar – This app just added the ability to take a pic of Walmart receipts like Ibotta and Checkout 51. Exciting stuff! Double Bonus: There is a new app called Snap by Groupon. You can do most of their rebates multiple times so you can really save big! UPDATE: Snap became the first of these apps to fall. Now it’s basically just a Groupon Lite app with almost no grocery deals. I’d skip it. At this point, is it really a bonus? : Mobisave – This is another new one. Take a look and see what it can do! Great info. Coupon in and Saving is not just for women. Way to break the “barrier”. Go to the Savings Catcher help on the Walmart app and scroll to the bottom where it talks about Bluebird. All the instructions are in there. Thank you very much every little bit helps these days. Is there a app for mobile coupons because I get print coupons off???? If you print a coupon from Coupons.com, it should allow you to print from your phone.